So let’s say you’re doing great in your healthy journey – working out five or more times a week, focusing on nutrition, and seeing awesome results! But then you get injured or have surgery, and suddenly you’re back to your old couch potato way of living because you don’t have a choice but to rest and heal. You might feel that no one can understand what you’re going through, and you probably have fear of gaining weight back. Well, I didn’t exactly get “injured”, per say, but I have been having a lot of health issues for awhile now – mostly gut/digestive problems, lack of energy at times, and just overall not ever feeling great. While I never would have thought this would prevent me from working out, it unfortunately has. I started seeing a therapist who said that my body has a lot of inflammation in it, and in order for that to heal, I need to take time off from working out or I’ll just be making my problems worse. As a trainer, there’s not much worse than hearing the words “You can’t workout for awhile.” And my response: “What?! 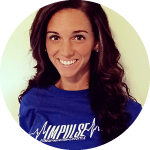 But my job is to motivate and educate people on proper workout techniques, and I want to lead by example!” However, because I did want to let my body de-stress and heal, I decided I needed to listen. It’s been almost a month now since I’ve worked out, and it has been HARD! I love working out; not just because I like the results, but I actually enjoy it. So I can truly identify with those of you out there who have had to take time off because of an injury, or whatever the reason may be. It’s not fun when you have no decision in the matter. ➢ I’ve chosen to really focus on my nutrition during this time. Yes, I ate mostly clean before, but I’m trying to really cut out those cheat days like I didn’t before. 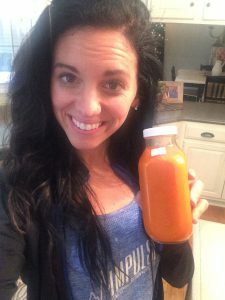 One of Kristin’s favorite things is carrot juice for breakfast! ➢ I’m also focusing more on portion control, as overeating on healthy food (wait, you can overeat healthy food?! Yes!) is something I struggle with. ➢ Find someone/something to keep you accountable with your nutrition during this time. I’ve started using a nutrition tracking app. This is a fantastic way to help you track your calories and macronutrients. ➢ Find different ways to de-stress. For me, and probably a lot of you, working out is a de-stressor. Try music, reading, self-pampering, etc. until you find something that works for you. ➢ Stay optimistic! Don’t let it get you down, and focus on the good in life and all of the things you still have to be thankful for. If I, being a trainer, can make it through this rough time of not working out, so can you!